In the first of a series of Food Crawls across Mumbai, I visit the little South India of the city- Matunga. This is an old neighbourhood in central Mumbai that has been the hub of South Indian food, traditions and produce for decades. The area has a sizeable population of the gentle people of the South and their mouthwatering delicacies are to be found in no-nonsense eateries that line the by lanes. If you want to understand the true meaning of ‘efficiency’, visit one of these old-world restaurants for a meal. The staff have their own rhythm and the owners, their own mild-mannered charm. People of all castes come here to savour the delicious fare and most are regulars, on a first name basis. I like the warmth and familiarity of eating here. The fact that nothing goes to waste. Even an empty seat finds a taker. And you often find yourself eating with another family at their table. It’s communal. It’s okay to share your space. And it’s actually quite interesting, in this age of neutrality. It’s almost impossible to have a bad meal here. Probably because nothing changes in these tiny, ‘upstairs-eating-also’ restaurants. Recipes remain the same. Flavours follow suit. The next generation of restaurant owners follow the same customs. And whenever I loose myself in a packet of spicy, salted-just-right potato wafers (crisps) from Cafe Mysore, I always think that this is exactly how they ate in 1936. Here’s a look at the first restaurant in the crawl- Cafe Mysore. 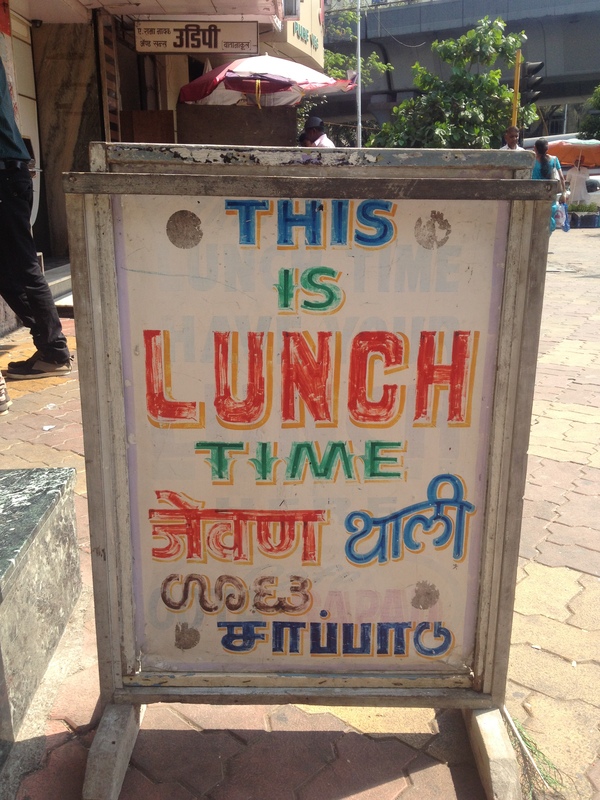 The oldest restaurant in Bombay for South Indian food – as the packaging and signboard suggests. Jalebi- South Indian style= sugar crush!! 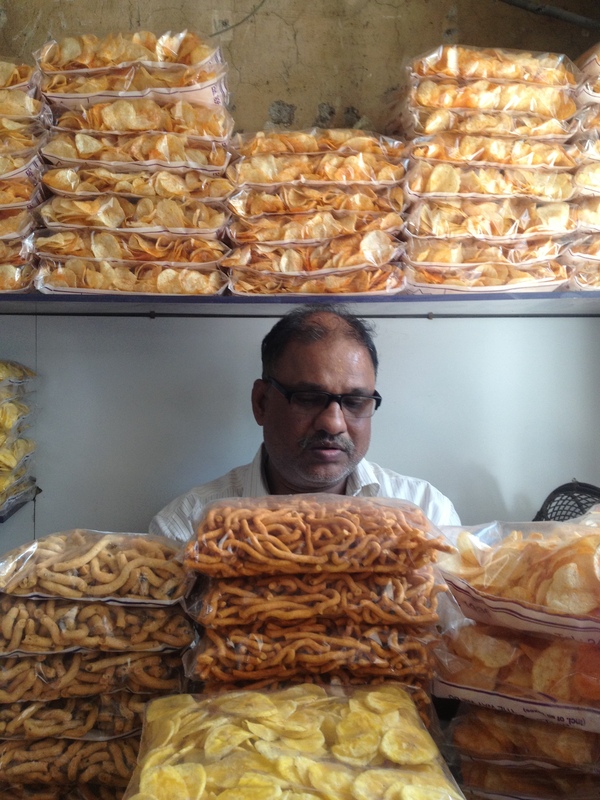 The owner of Cafe Mysore, walled in by the delicious crunchiness of South Indian snacks. They’re very clear about what they serve when. No breakfast all day. And at 12 pm, you are reminded as you enter. Few things in life are as comforting as a Bisebele Bhaat or Lentil Rice one-pot meal. What I always eye greedily though, are those crispy fryums that come with it. The Vada- A crisp on the outside, soft on the inside lentil cake that is hard to have a single serving of. Especially if they’re just out of the pan and doused in sambhar. Sambhar and Coconut Chutney- the two must-have accompaniments to any south Indian meal. They add a splash of contrast and colour to the table. This minefield of powdered spices or podi is liberally brushed on to a pesarattu dosa, which is a crepe made with mung beans. The glistening bits are the ghee- also known as my new found love! Piquant, spicy and steeped for many months. This is the distinctive Lime Pickle you will find at South Indian restaurants. It adds a bite to the otherwise, mild, healthy food. Stew and Idiappam. A classic combination for me. The stew here is mild yet distinctly aromatic with the spices used. I always feel so good about myself eating stew, it’s the rare occasion I eat all my vegetables and ask for more. Previous Previous post: Ask Me Anything!! I’m on Reddit today! Next Next post: What all Pulaos should be- the Goan Sausage Pulao!